Botox works by temporarily blocking your nerve impulses to the injected muscles. This reduces muscle activity that causes lines to form between the brows, on the forehead and around the eyes. In addition to smoothing out wrinkles and lines for a beautiful, refreshed look, these treatments can help prevent wrinkles from deepening. Results of Botox treatment are gradual and take up to 2 weeks to become completely visible. Although they can last several months or more, results are temporary. For this reason, these injections must be repeated for continued success. Over time, having Botox injections in the same area can yield longer-term results between treatments. Botox injections are made with a very fine needle for utmost comfort. Because these treatments are delivered precisely in very small areas, several injections often are needed to fully treat lines and wrinkles. When used properly, Botox side effects are very rare. Botox can also be injected into the skin to treat symptoms of severe underarm sweating (severe primary axillary hyperhidrosis) when medicines used on the skin (topical) do not work well enough in people 18 years and older. The results are expected to last 6 to 8 months. It is not known whether Botox® is safe or effective for severe sweating anywhere other than your armpits. Am I a Botox Candidate? The amount of Botox you need depends on several factors, such as amount and depth of your wrinkles , the area you are interested in treating and the look you are trying to obtain. A face to face complimentary consultation with one of our highly skilled nurse injectors is the best way to determine what is right for you. Why do you charge per unit instead of per area? Every client is different and everyone has different lines with their muscle movement.We feel that we can achieve the best results in the most economical way by charging per unit. This way you only pay for what you need. Botox starts to work in about 24 hours, but you may not see your full result until up to 2 weeks from the treatment. Because the treatment is delivered with a small needle, it is possible to have a small amount of bruising and tenderness at the site of injection for a few days. Ideally, anyone who is undergoing injectable treatment should prepare for their procedure by avoiding anything that thins the blood. We advise our clients to stop taking medications/supplements such as Aspirin, Aleve, Ibuprofen, Vitamin E, fish oil, gingko biloba, ginger, and green tea, for 7-10 days prior to treatment in order to reduce the risk of bruising. 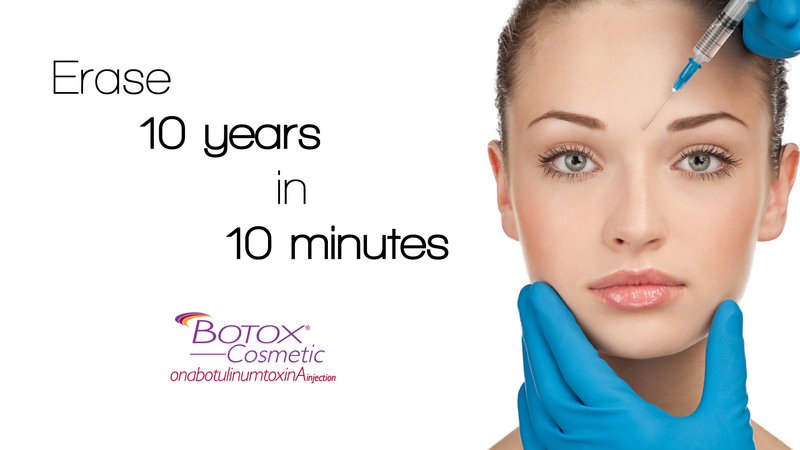 Generally, Botox takes about 7-10 days for the full effects to show, and last between 3-4 months. As you continue to get regular treatments, the results can last longer.